Hi there! 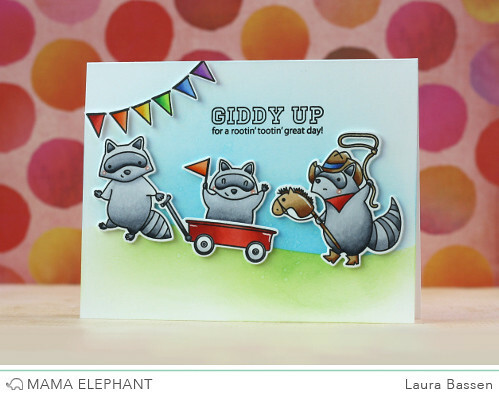 Laura here and today I'm sharing a project featuring the hilariously adorable Rowdy Raccoons set. Here's a video to show you how I created my card. Giddy Up for a routine' tootin' great day, my friends! Thanks so much for looking! Great job ladies and I hope you both have a rootin' tootin' good day! Rootin' tootin' good time...LOL...Emma did a great job with her part of the voiceover...cute! Yahoo! Party on raccoons! Great card Laura. Wow you might lose your voiceovers so to Emma! What a great storyteller! So completely awesome - what a party those rowdy critters are having!! Laura - your card and your video are super delightful! !